Most prefer a referendum on a new casino than City Council approval. A new random telephone survey of 505 Kingston residents commissioned by 1000 Islands Accommodation Partners (TIAP) and conducted by independent polling firm Abacus Data finds that among residents with an opinion about a new casino in Kingston, a large majority (60%) are opposed to plans to build a new casino. Only four in ten Kingston residents (40%) support a new casino in the city. 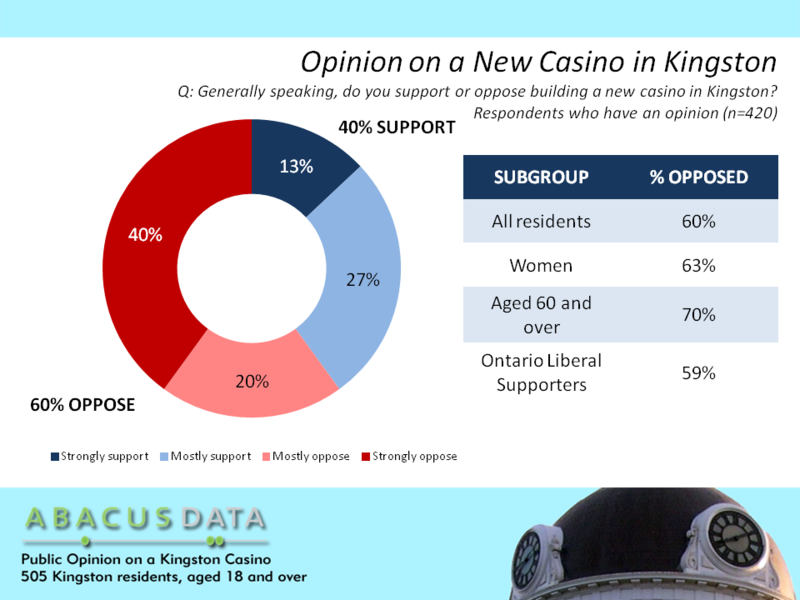 More significant, the percentage of respondents strongly opposed to a casino in Kingston is far greater than the number who strongly support a casino (40% strongly oppose vs. 16% strongly support). 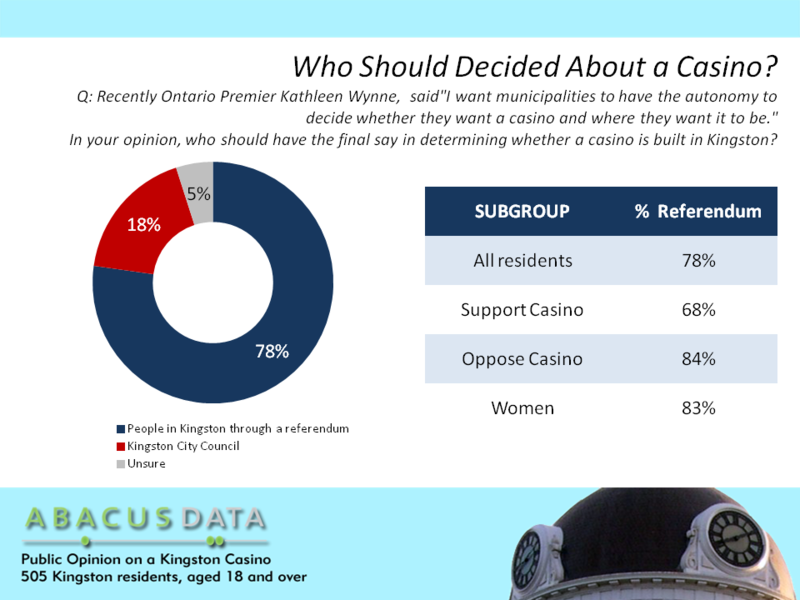 After respondents were told that Ontario Premier Kathleen Wynne said that she wants municipalities to have autonomy to decided whether they want a casino or not, respondents were asked who should have the final say in whether a casino is built in Kingston. Overall, 78% of respondents said they thought Kingston residents should have the final say about a casino through a referendum while 18% believed that Kingston City Council should have the final say. The analysis in this report is based on telephone interviews conducted February 13-15, 2013, among a random sample of 505 adults 18 years of age or older living in the City of Kingston. The survey was conducted by live interviewers in Ottawa, Ontario. The statistics of a random sample of 505 respondents are accurate to within 4.5 percentage points, plus or minus, 19 times out of 20. For more information about the poll’s methodology or the results, please contact David Coletto, CEO at david@abacusdata.ca or 613-232-2806.